Phase 1 has begun and in early November, GWNA hosted a community meeting with block clubs, the CTA—Jeff Wilson and Alderman’s office—Tressa Feher, to start the discussion on best use for the public space and pedestrian access. The Wilson L Reconstruction Project has the power to transform Uptown and this sketchy and unsafe area into a remarkable TOD (Transportation Oriented Design) with a thriving retail corridor, beautifully landscaped public plaza and great amenities like pop-up farmer’s markets. Cold weather has done little to slow down the gangs, violence and drug dealing. On Tuesday, December 9, a little after 10 Am, a young man was shot in the head after completing maintenance on fire extinguishers at the Wilson Men’s Club. He was an innocent victim who unfortunately was in the line of fire as the gang bangers attempted to shoot their intended victim who was sitting in a parked car a few feet away. The victim died the next day from his head wounds. Neighbors are banding together to tackle another criminal housing problem in our neighborhood. Several folks living by 4315 N Magnolia observed a stream of people, with their loud woo-woo calls, signaling drug dealers in unit E from early morning to late evening. They reached out to other block club members, contacted the CHA security director, Kates Detective, who monitors other CHA properties and the alderman’s staff. Steps are being taken to remove the gang/drug dealers. We’ve started a very active 911 call tree as part of our public safety initiative. More information in our next newsletter on people coming together to take back our streets and neighborhood. Please go to www.uptownupdate.com and read the comments posted to the article on the murder on Wilson. Excellent points on how the criminal housing keeps the gangs and violence right out our front doors. You can click the link to read the rest of Uptown Girl’s comments or copy and paste the link below. VOTE! Municipal elections are upcoming and that means we need to get out the vote. There are three candidates running for alderman of the 46th Ward. Be sure to read up on each candidate and make an informed decision when you enter the ballot box. Beyond that, remind your neighbors and anyone else you know in the 46th Ward of the date and let’s get everyone out to vote! Happy Holidays to you and yours from the GWNA Family! And let’s all look forward to a healthy, prosperous and SAFE 2015! Last night, the CTA held an open house meeting at Truman College to unveil its initial plans regarding the planned renovations to the Wilson L station. If you missed it, a great write-up on the event can be found on Grid Chicago. 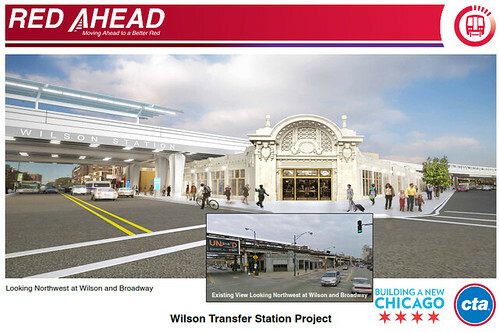 You can also view the CTA’s page about the Wilson Station project. CTA property at, around, and leading to the Sunnyside entrance needs to be put to good retail or public use, including pedestrian plazas. We encourage additional constructive comments beyond those four main points. We need the same comments to go to the 46th Ward’s Alderman, James Cappleman, at info@james46.org and to Mayor Emanuel via http://webapps.cityofchicago.org/eforms/org/cityofchicago/eforms/controller/contactUsForm/preFeedbackForm.do Mailed comments to the Alderman and the Mayor can be sent to their attention at City Hall, 121 N. LaSalle Street, Chicago 60602. Thanks to the 57 GWNA members who completed our GWNA Menu Money Survey and shared their suggestions for spending the $1.3 million allocated to each ward for our streets and alleys’ improvements. To review the survey executive summary, please click here (PDF). Residents were also asked to comment on the Sunnyside Mall with ideas on improving this public space (and people had a lot to say!). To see everyone’s ideas and comments on Sunnyside Mall, please click here (PDF). Some of the changes are happening now. The alley between Malden/Magnolia has already been stripped of asphalt. The Sunnyside Mall will not be getting running water due to costs and its the responsibility of the residents based on how it was designated when it was created. The Alderman suggested that we could meet with a rep from the Water District to discuss collecting rain water via rain barrels and creating retention ponds in the mall. The alley between Clifton and Racine is not scheduled to be resurfaced at this time and when it is, it will likely not be using brick pavers due to costs. Lighting: The city is getting away from light poles with 2 lights (one over the road and one over the sidewalk). The ones over the sidewalk break too often. We were told that it is the responsibility of the neighbors to light the sidewalk. A few days ago, I saw the guys turn on the water at Broncho Billy and they said the city is going to implement timing devices on all of their water features city wide with a 15 minute/15 minute off cycle. The buttons that you push to turn on water features are too expensive to be repaired and they are frequently breaking. The 43rd Annual Gay & Lesbian Pride Parade will have a new parade route with the starting point stepping off from Broadway & Montrose at noon on Sunday, June 24. GWNA neighborhood will include the staging area with floating lining up at 8 a.m. along both sides of Montrose from Broadway west to Clark St, and marchers along both sides of Broadway from Wilson to Montrose. We are in contact with the alderman’s office and various city departments to ensure our neighborhood ends up safe and clean and that parade visitors respectfully enjoy our neighborhood. Residents should be prepared for huge crowds at the Wilson El Station and throughout the neighborhood. Plan on severe traffic disruptions. Street parking along Montrose and Broadway will be banned, And through traffic will likely be closed. Please plan ahead. More information from GWNA will be sent closer to the parade date. Wilson El Station Reconstruction Survey—We want to hear from you! If you haven’t heard, the Wilson El Station will be undergoing a massive reconstruction project thanks to $135 million from various sources. The initial planning and survey work has already begun. This reconstruction will be the single most important project in shaping our community’s future. For those of us who have endured the Wilson El Station’s current conditions—we look forward to sharing our ideas on the project. We’re asking you to take just a couple minutes and answer the survey questions now. Please click here to take the Wilson El Station survey now! Our intention is to collect the comments and ideas from a broad range of people who do or would use the Wilson El Station and present these findings to The Alderman and the CTA. We believe this information will be essential for making public transportation a safe and welcoming gateway to Uptown. After you take the survey, we encourage you to please forward it to others. The CTA is still taking public comments on their plans to modernize the red and purple lines. Possible outcomes could be anything from doing minimal repair work to shutting down stations to turning the north side red line stations into a subway. So, have at it; please send your comments to the CTA at rpm@transitchicago.com.